The 2019 Annual General Meering took place on Friday January 18 2019. Club meetings are held several times a year on Fridays at 10 AM at the SAR building. Coffee is at 10 am in the SAR building on other Fridays, except on the first Friday of the month when it is at the Salt Spring Island Golf and Country Club. SSARS is putting on a radio course for new members to obtain their Basic Amateur qualification from Feb 17 to March 10 2019. There was high demand for the course after the Dec 20 2018 wind storm, so space was limited. A "waiting list" has been started for the next course. Sign up now! The next Canadian Vintage Radio Society swap meet will be held on January 20 2019. Presumably it will be from 12 pm until 2 pm like last year. It will take place at Charles Rummel Park at the corner of Lozells Avenue and Government Rd in Burnaby. Free admission! (sellers tables $5). Winter Field Day is presented by the Winter Field Day Association. The WFD is a dedicated group of Amateur Radio Operators who believe that emergency communications in a winter environment is just as important as the preparations and practice that is done each summer but with some additional unique operational concerns. Operation can be from a remote Indoor location, set up Outdoors, or from at Home, so everyone can participate. WFD runs for 24 hours during the last full weekend in January each year from 1900 UTC (11 am PST) Saturday to 1900 UTC (11 am PST) Sunday. For 2019, the dates are January 26th and 27th. The 2019 British Columbia QSO Party, sponsored by Orca DX and Contest Club, will run from 1600z February 2 to 0400z February 3 and from 1600z to 2359z on February 3, for a total of 20 hours... 12 on Saturday and 8 on Sunday. That is 8 am to 8 pm Pacific time on the Saturday, and from 8 am to 3:59 pm Pacific time on the Sunday. Rules, tools, helpful hints, in-depth event analysis/reports and scores from past years, examples of the lovely photo-based certificates and plaques are all available for viewing from links on the BCQP page of the Orca DXCC website. Go to www.orcadxcc.org. The 2019 BARC Annual Swap Meet is Sunday March 03 at the Queensborough Community Centre (920 Ewen Ave) in New Westminster from 10:00 am until 1:00 pm. 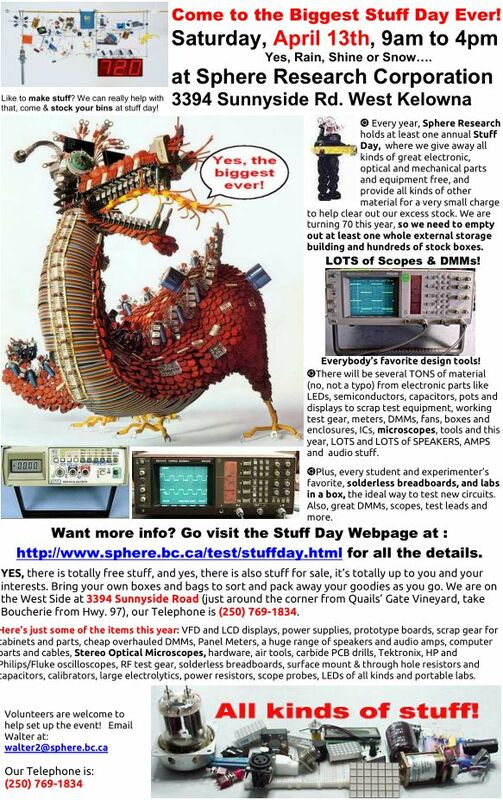 The Comox Valley Amateur Radio Club annual swap meet will take place at 10 am on April 7 2019 at the Florence Filberg Center, 411 Anderton Ave in Courtenay. The RARC swap meet and Emergency Communications Equipment Display will take place between 10 am and 1 pm on Saturday, April 6, 2019 at the South Arm United Church at 11051 No. 3 Road on the SW corner of Steveston Highway. There are plans for a greater number of emergency communication equipment displays this year. General admission is $5 per person (with free admission to children 12 and under) and vendor tables are $20 each. Free parking is available in the church parking lot and along No. 3 Road where permissible. There will be the usual door prizes from local and national suppliers, special raffles (licence pending), as well as a beverage and snacks area. The Comox Valley Amateur Radio Club will sponsor the "Lucky Seven" Swap Meet on Sunday, April 7, 2019 at the Florence Filberg Centre, 411 Anderton Ave. in downtown Courtenay. It takes place from 10 am to 1 pm. The Annual Stuff Day in Kelowna is on April 13 2019 from 9 am to 4 pm at the Sphere Research Corporation at 3394 Sunnyside Rd, West Kelowna. Every year, they give away all kinds of great electronic, optical and mechanical parts and equipment free and provide all kindes of other material for a very small charge to clear out excess stock. There is a pancake breakfast from 8 am to 9 am. This is 1 Block South of the Lougheed Hwy In the old REC Building. Call Nick (604) 465-9476 for more info or email Dave at . Call 250-937-0564 for more information. Details for 2019 are not yet available. This year, Field Day it will be held on June 22 - 23. Vancouver Island Ham Happenings, hosted by NARA took place on September 8, 2018. It was held at Cedar Hall, 2388 Cedar Road in Nanaimo. The talk-in frequency was on the VE7ISC repeater on 146.640 MHz + T 141.3 Hz. Vendors 9 am. Buyers 10 am. No sales until 10 am. Ample parking and air conditioned premises! Details for 2019 are not yet available, but it will be sponsored by CVARS. The Delta Amateur Radio Society hosted the 2018 Comfest Swap Meet on Sunday, September 30, from 10 am to 1 pm. It is a great venue to meet fellow hams, buy and sell gear or simply discover what the world of Amateur Radio has to offer. Last year, it took place at the South Delta Recreation Center, 1720 56th Street in Tsawwassen, just off of highway 17. There is plenty of free parking. The date for 2019 is not yet set. The details for the Maple Ridge Amateur Radio Club fall swap meet are not yet available. The Richmond Amateur Radio Club hosted a day-long seminar for radio Amateurs and the interested public back on November 10 2018, from 9 am to 4 pm. It was held at the Steveston Community Centre at 4111 Moncton St. (at No.1 Rd.) in Richmond, BC. It consisted of presentations and informal discussions on a variety of Amateur radio topics. Admission was $5. There were be two $50 gift certificates from Radioworld for door prizes. Details for 2019 are not yet available. This document (updated) about the use of electronic devices while driving in BC (578 KB) was downloaded from the BC Government web site on March 9 2017. It spells out what is and what isn't allowed while driving in BC. Obviously, cell phones shouldn't be used except when using it "hands free" like with a car-kit or a Bluetooth headset. For amateurs, the bottom line is that an HT can only be used if it is attached to the vehicle or worn securely on your person. This really means using a speaker-mic with it so the HT is not in your hands. Mobile radios can be used, but only if the radio is attached to the vehicle. The microphone must be within easy reach. If you use a radio while driving, you might want to print a copy of the document and keep it with you. Some radios also have optional Bluetooth interfaces that would allow the radio to be used in a "hands free" mode. Distracted driving regulations were mentioned in the July 2016 RAC report. Regulations vary province by province. The VE7AB / VA7DZ contest station in the Radio Propagation Lab at UVic. He is willing to pay the cost of Travel from Victoria to your town [RAC does not have budget for this] but he would appreciate a bed at someone's house for overnight. Contact him directly by to set up a visit. SSARS members assisted with communications for the Swiftsure International Yacht Race race in 2013, 2014, 2015 and 2016. The first three years they were at Swiftsure Bank. In 2016, they were at the much busier Neah Bay. The Swiftsure race is probably the largest non-emergency "exercise" that local hams will be involved with. The race is hosted by the Royal Victoria Yacht Club. The starting gun for the 2018 race was fired at 09:00 May 24 2018.